Don't let the tough outer case fool you - the Fujifilm FinePix XP60 is a budget camera at heart. If you've ever been afraid of losing or destroying a camera and aren't too concerned about image quality, the FinePix XP60 could be the camera for you. 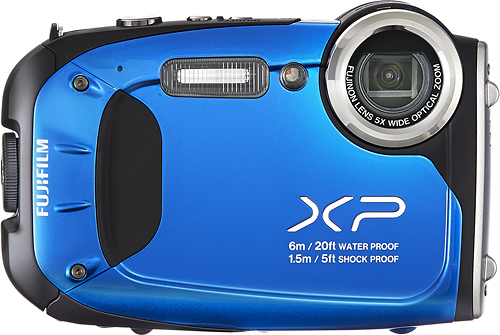 The FinePix XP60 packs a good value in a strong, sturdy frame. The camera's image quality won't win any awards and the abysmal battery life will deter users who need a lasting camera, but the FinePix XP60 is a good choice for users who need a rugged camera that won't fall apart in an extreme environment. The camera is a bit on the bulky side, measuring in at 4 x 2.6 x 1 inch and weighing nearly half a pound. Most of this is due to its rugged design, which features a ridged rubber exterior and metallic buttons. It's as stylish as an off-road camera can get, featuring a distinctive and easily recognizable design. It offers a 2.7 inch LCD screen on the back along with an arrya of buttons for navigating the menu. Along the top of the camera are the power buttons, burst mode buttons, the shutter button, and a sliding lock for preventing the camera from accidentally recording. The buttons are somewhat on the small side and are particularly difficult to press when you're wearing gloves. The right side of the camera houses the battery and SD card. The FinePix XP60 goes to show that megapixel count isn't everything. While photos have an enormous resolution, they don't have an enormous amount of detail. Images are noisy and lose their sharpness, and without built-in sharpening you'll end up relying on post processing to make your images look presentable. The FinePix XP60 doesn't have a long enough exposure to take decent night photos, and the added noise makes dark images barely recognizable. That being said, Fujifilm offers several scenes to optimize the camera settings as much as possible. The FinePix XP60 supports 1080p and 720p videos at 60 frames per second, as well as VGA (640 x 480) up to 240fps. Burst mode can take up to 10 high-definition images in a second, while the Optical Image Stabilization feature reduces blur associated with a moving image. The FinePix XP60 includes a wealth of other interesting features including shooting 3D scenes, panoramic views, automatic focus, HDR, and face detection. The FinePix has a negligible battery life. At only 90 minutes, it's guaranteed you'll need at least 2 or 3 spare batteries for even a single session. Outside of that, the camera performs reasonably well considering it can be used in practically any environment. That is, as long as you can hit the buttons. Unlike some of the offerings of its competitors, the FinePix XP60 doesn't include built-in Wi-Fi or many options for mounting the camera. Fujifilm offers MyFinePix Studio, a desktop image editing suite, that makes it easy to upload, manage, view, and print images. Built in social networking allows you to quickly share clips with friends and family. The FinePix XP60 is as tough as they get, but its rugged outer case protects some rather weak components. It's a good budget camera for rough environments, but there are better options out there.